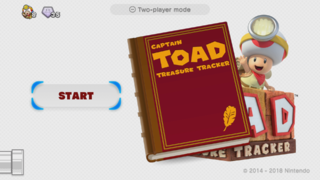 Captain Toad: Treasure Tracker on the Nintendo Switch is a port of the original Wii U game released in 2014. Due to the distinct differences to the Wii U hardware and lack of a usable touch screen while playing the game on a TV (or disconnected Joy-Cons in Table Top Mode), a permanent onscreen gyroscope controlled cursor was added for Captain Toad's Switch outing. Though, the portable mode retains the original's touch screen gameplay much like the original. The most notable change besides the controls are the removal of the Super Mario 3D World-based bonus stages in favor of ones based on Kingdoms featured in Nintendo's more recent Mario platformer, Super Mario Odyssey, as well as retconning the ending a bit for similar reasons. Interestingly, a huge collection of lost developement related assets were accidentally left in the Switch build of the game, revealing lost levels, objects and features. General and misc. Differences; Pop-Up Prairie Town, for example, uses normal moving platforms. Scrapped courses, 3D World leftovers, E3 variants and more! Early courses and test levels. Remember Cat Goombas? Pepperidge Farm remembers. Level selection art for... the game over stage?! Just... one... more... Gold Mushroom! The ending was altered to serve as a lead-in to Super Mario Odyssey, complete with a new end card and track to go with it. However, the track used in the Wii U version is still present in the game's files, although unused. DebugData\Buildinfo.txt appropriately contains some build info along with a developer note. The equivalent file in Photos with Mario, a game that uses the same engine as Treasure Tracker, suggests that the last two pieces of info are the "target" and the "region", respectively. The final edit to the game happened on April 26th 2018 at 10:30:07, presumably by Rory Johnston, who is in the staff credits for the game. The final edit to the demo happened on May 3th 2018 at 09:44:28, roughly 25 days after the normal game, presuembly by Yoonjoon Lee, who is in the staff credits for the game. Both edits seem to fix an "MCAT" - maybe an issue/bug that was recorded. For some reason the normal game build is listed as "Pilot" rather than "Release" - this is presumably an oversight. According to the Odyssey jingle's filename (rs_EndJingle_180307), the track was finalized on March 7th, 2018. For some reason, the Game Over Cave contains a Power Star that is placed far out-of-bounds the area. Normally, bonus levels do not contain Power Stars at all. Updated two player cooperative play. Prior to this update, the second player could only control a pointing reticle and assist the 1st player. Now it's possible for the second player to control a Toad/Toadette clone on-screen with the first player. The on-screen cursor displayed while the game is played in TV/Tabletop mode now fades when left unused for a short period of time. Players can now toggle their character's headlamp by tapping the playable character with the pointer. Players may also toggle their partner's headlamp when playing in Adventure for Two mode. The second player in Assist Mode can toggle the first player's headlamp in this way. On the pause screen, there is now an option to restart a level from the beginning. It is no longer possible to run over Spinwheels in Handheld Mode, as the game instead automatically snaps the player to the spinwheel without touch screen input, same as it always acted in TV/Tabletop Mode. Support for a DLC expansion titled "Special Episode". The stage "Shifty Shrine" was added as an early purchase bonus for the upcoming expansion and added to the main menu. This patch was released on March 14th, 2019. It adds the remaining levels of the Special Episode DLC.